Planning permission has been granted for the redevelopment of two leisure centres in Belfast. 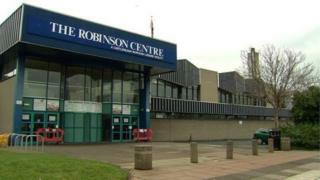 The city council says transforming the Robinson Centre in Castlereagh and Brook Activity Centre in Twinbrook will cost about £35m. Councillors also approved revised plans to create the city's biggest and tallest hotel. Windsor House will be converted into the Grand Central Hotel, with the number of rooms up from 200 to 304. Belfast City Council said the £20m transformation of the Robinson Centre will see the existing building replaced with a state-of-the-art facility, including an eight-lane pool and leisure waters. The centre closed in 2015 due to health and safety concerns over asbestos. The £15m rebuilding of the Brook Activity Centre will focus on outdoor leisure, such as a new Gaelic football pitch, two football pitches and three indoor and three outdoor five-a-side pitches. The developments are part of Belfast City Council's £105m programme to improve leisure centres across the city. Cllr Peter Johnston, chairman of the council's planning committee, said the two redevelopments were an "investment in the future health and well-being of both the city and its citizens". "We now look forward to construction work on both these projects beginning over the summer, and to the facilities becoming operational in the early part of 2019," he added. At Tuesday night's planning meeting, the green light was also given to revised plans for Windsor House, Ireland's tallest office block - bought by Hastings Hotels in 2015. The Grand Central Hotel will have 304 bedrooms plus serviced apartments and offices.